Gravity Falls is an animated cartoon series created by Alex Hirsch. This animated Series about Twin siblings Dipper and Mabel Pines. Who are in for a much unforeseen adventure, when unexpectedly they go and spend their summer with their great uncle in the puzzling town of Gravity Falls. When they arrive, Dipper and Mabel's mystifying great uncle Stan, enlist the twins' to help run The Mystery Shack. The mystery shack is a fun tourist trap that great uncle Stan owns, that overcharges unsuspicious patrons. 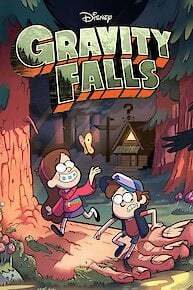 Quickly, Dipper and Mabel discover The Mystery Shack itself is a hoax, also both sense a baffling strange feeling about Gravity Falls, then both begin to unlock the secrets of the confusing town of Gravity Falls. Alone with all of these creators there is adult humor. Also, the animation is one great. This show is made for kids but the whole family will like this show. The crazy characters are one of the great things that make it worth watching this show. All of the characters have something about them self to bring to the plate. Also, you see characters you're already know in the background, it make you have that "small town feel" of Gravity Falls. The characters are all great, Stan and His invariable cheapness towards all is very funny. Most of the characters are quite enjoyable, for example two are, Soos is just your average stereotype of a guy who acts like a child. Pacifica is the "popular blonde" girl that everyone is strained to like. Ford discovers Bill's ultimate motive and one last confrontation with Bill results in the Pines family's final fate and biggest sacrifice. While Ford discovers Bill's true motives, the Mystery Shack crew forms a plan to fight back. A final confrontation against Bill leads to the Pines family's ultimate fate. It's up to Dipper, Soos and Wendy to rescue Mabel from a weird new world, while Bill's squad plans what they will do next. Mabel arranges a 13th birthday celebration for her and Dipper; Dipper wanders below the city to find a big surprising secret. Grunkle Stan travels to Oregon with the kids. He tries to destroy the tourist traps. Peril faces Mabel entering the enchanted realm of the unicorns. Dipper discovers something about the obscure Bill Cipher. Grunkle Stan decides to run for mayor and Dipper and Mabel try to help become the ultimate candidate. Dippers favorite board game come in the mail and his great uncle plays it with him. With Stan in custody, Dipper and Mabel wonder how much they really know about him. Pacifica gets Dipper's help to get rid of a ghost in the Northwest Mansion. Mabel takes matchmaking to a whole new level when she steals a love potion from a real love god. Blendin Blandin is back to face Dipper and Mabel. The kids, along with Old Man McGucket's help, discover there is a secret society in Gravity Falls. Stan is cursed by a witch; Mabel braves Claymotion; Waddles eats a bowl of jelly and creates a machine that permits him to speak. Soos wants to go on a date, so he decides to look into a dating simulator. Mabel decides to put on a huge sock puppet rock opera. Mabel and Pacifica battle it out in a miniature golf contest. The family tries to return back to normal by throwing a party. The family tries to get things back to normal by hosting a party. Behind the scenes insight from Alex Hirsch. Li'l Gideon has swindled the Mystery Shack away, forcing Dipper, Mabel and Grunkle Stan to shack up with Soos and his grandmother. Dipper, Mabel and Soos navigate through Grunkle Stan's mind to defeat a tricky dream demon summoned by Lil Gideon. A prehistoric beast takes Mabel's beloved pig, and the Pines family travel to a land trapped in time to rescue it. When Mabel discovers the truth about her favorite boy band, she takes action. Meanwhile, Dipper believes that Robbie plans to brainwash Wendy with a secret message that is hidden inside one of his songs. The twins discover a hidden room inside the Mystery Shack and compete over who should have it. Mabel befriends a cute merman who gets trapped in the deep end of a public swimming pool. Meanwhile, Dipper volunteers at the pool to be closer to Wendy. While Stan, Dipper, Mabel and Soos are falling in a bottomless pit, they swap stories to pass the time. Mabel and Stan make a friendly wager that whoever makes the most money in three days can run the Shack for the summer. Dipper and Mabel go trick-or-treating in the summer and are confronted by a candy-loving monster who threatens to devour them if they fail to bring him sweet eats. Feeling insecure that Mabel is becoming the alpha twin, Dipper seeks a magical way to grow taller. After being challenged to a video game battle by Wendy's boyfriend Robbie, Dipper is thrilled when his favorite playable fighter, Rumble McSkirmish, comes to life to defend him, but Dipper soon loses control over Rumble McSkirmish and has to find a way to stop him. Dipper wants to correct a mistake he made in the past with assistance from a time machine. Meanwhile, Mabel is overjoyed when she wins a pet pig at a fair. When Stan hosts a big weekend party to promote the Mystery Shack, Dipper uses a unique copy machine to make clones of himself so he can impress Wendy. Meanwhile, Mabel defends her two friends and fights for the Party Queen title in their honor, instead of having the popular girl and her group win. Dipper is invited on a trek that leads to an abandoned, possibly haunted convenience store. Someone messes with Mabel's life-size wax statue. The twins are convinced there's a legendary sea monster living in the local lake. Twins Dipper and Mabel Pine are staying with their great uncle for the summer in Gravity Falls, Oregon. He runs a strange museum and the twins find that things aren't what they seem in this little town. Gravity Falls is currently available to watch free on DisneyNOW and stream on Disney. You can also stream, download, buy, rent Gravity Falls on demand at Amazon, Hulu, Sling, Google Play, DIRECTV NOW, iTunes online.